So, you sent your web development offshore, or you’re about to do it. It’s cost, isn’t it? It’s always about cost. But should it be? You likely didn’t skimp on cost or go offshore when you designed your business or personal brand collateral, did you? If you did, then you likely already know that what you got was less than what you had expected. Perhaps you had to go back and forth a lot more with the designer than you otherwise would have to get what you wanted. Or, perhaps you learned your lesson early and paid well to have it done well…and more locally, taking advantage of the fact that people in your own cultural, language, and national context would “get you” more intuitively. 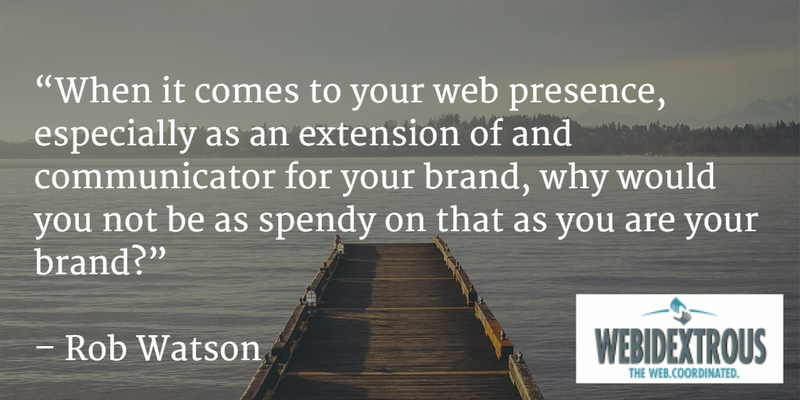 When it comes to your web presence, especially as an extension of and communicator for your brand, why would you not be as spendy on that as you are your brand? Are you sure that the low cost is worth the extra effort? Are you certain that you’ll get the same quality overseas as you’d get more locally? By effort, I mean the time cost of getting it done correctly. I don’t doubt that there are plenty of good offshore developments shops. I’ve worked with a few good ones. My experience in managing the work of offshore shops is that it is considerably more time-intensive and inefficient to deal with them. Many times you’re between 12 and 24 hours separated from them. That means you have to adjust your project plan to account for doing and reviewing work when you’re both awake and available. Sometimes your “doing and reviewing” window is less than 3 hours long! By quality, I mean domain knowledge, culture, and language. The domain knowledge required to successfully launch some country-based business topics, products, and brands requires an innate cultural and idiomatic understanding of the industry in your local, regional, and national markets. While not impossible to find an offshore company who “gets you” and what you’re trying to do in the most minute details of the typical business transaction, it is rather difficult. Most of your time on the project is going to be spent explaining the who, what, why, and how to an overseas shop. Why do that to yourself? Why pay more on the back-end than on the front end? My advice is to first look “onshore”. Yes, it does likely cost more due to an increased cost of living and other factors that onshore shops have to charge you for in making a living. Just think of what your time is worth, and all the time you’ll save not having to explain and re-explain concepts to your offshore developers that are more intuitive to people in an onshore shop. Do you agree or disagree? Let me know in the comments.